Two significant developments on campus and near downtown Green Bay illustrate the importance and power of partnerships in the life of UW-Green Bay. The first is right here on campus, as the Brown County STEM (Science, Technology, Engineering and Math) Innovation Center, which broke ground Sept. 17, 2018, is quickly taking shape and becoming part of the campus skyline. Excitement is building for TitletownTech in the shadow of Lambeau Field. The second is front-and-center in the shadow of Lambeau Field, as the finishing touches are being put on the 46,000-square-foot, modern, steel-and-glass silhouette of TitletownTech. “What’s another building or two?” you might ask. Universities and downtowns regularly construct new buildings. It’s the way they keep their infrastructure in step with the needs of their respective communities. These buildings do all that — and then some. 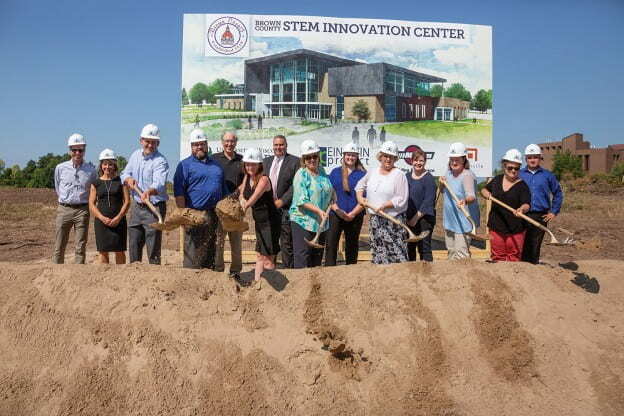 The Brown County STEM Innovation Center will provide about 63,730 square feet of space to house the new Richard J. Resch School of Engineering, the popular and creative Einstein Project, the community-focused UW-Extension, and Brown County’s Land and Water Conservation departments. The facility is expected to open sometime in August 2019. Of great significance, the building, its occupants and its shared workspace demonstrate the power of partnership. The partners are able to do more than any of them could do alone and the effect of their collaboration ripples from the campus, across the community and into the region. The $15-million construction budget is shared among three central partners: the State of Wisconsin capital budget, Brown County funds and private donations from citizens and organizations intent on sustaining a thriving, public University and the social, cultural and economic gains that come with it. UW-Green Bay Chancellor Gary L. Miller commented on the gap the Center closes by hosting the Resch School of Engineering. He said that the community has been asking for engineering and STEM programs for decades. The excitement is building for TitletownTech — and its unique partnership that can be a model for the future. The collaboration between UW-Green Bay, the University of Wisconsin System, the Green Bay Packers and Microsoft Corporation — is poised to serve as a hub for business innovation and economic development in the region, the state and the Midwest. It holds promise to keep local young talent in a region that is thriving for more reasons than its storied NFL franchise. 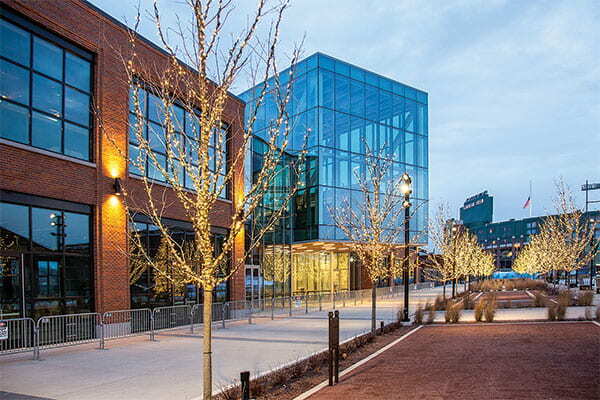 A description on the Green Bay Packers website shows this state-of-the-art building will feature the TitletownTech Venture Studio, TitletownTech Innovation Lab and TitletownTech Fund. The center is designed to connect start-up businesses with investors and promote business development and growth, particularly in the technology sectors. A UW-Green Bay and the UW System “Entrepreneur-in-Residence” (EIR) will work as part of the TitletownTech leadership team. The EIR role has three main foci: 1. Work with UW-Green Bay’s Cofrin School of Business to educate and provide guidance in business and operational areas. 2. Work with the UW System’s Economic Development Office to generate collaborations with all UW System institutions. 3. Establish connections to the business community and be their single point of contact. Deepening the connection between the organizations, UW-Green Bay alumnus Craig Dickman ’82 (Business Administration), who brings his reputation for innovation, was named TitletownTech’s managing director in September. Dickman is the founder and former CEO of Green Bay-based energy logistics company, BreakthroughTM. In an interview with the Green Bay Press-Gazette, Dickman reflected on the nature of the facility and its vision. “We’re really trying to create something that’s world-class,” said Dickman, “so we can transform this region’s economy, transform the businesses that are here and bring innovation capabilities focused on building scalable new ventures in our area.” The support of Microsoft is key to those innovation capabilities. Not only will it provide two full-time staff (one of whom will be a technologist-in-residence), it will bring its global digital resources to support TitletownTech’s mission and vision. Those resources include people and technology. By connecting those resources with new and existing businesses, teams working at TitletownTech will help them incorporate digital capabilities into their operations. Ed Policy, Packers chief operations officer and general counsel oversees Titletown development. He sees TitletownTech as a natural extension of the Packers’ vision for the area. “We intended to develop Titletown as a magnet to draw world-class employees,” states Policy on the Packers website. “The Microsoft involvement clearly takes this to another level. The remainder of the century will belong to communities that can draw talented young people.” And developing talented young people is what UW-Green Bay is all about. Through the power of partnerships like these, the University aims to attract and enroll Brown County students, continuing the five-year enrollment growth trend it touted in November. The Education program, with Bay Beach Wildlife Sanctuary and Green Bay Area Public Schools, partner in a nature-based four-year-old kindergarten program. Psychology partnered with multiple high school psychology teachers from across the state to organize a day-long teaching of psychology conference for more than 50 attendees. Cofrin School of Business students were provided a valuable networking experience by Kohler Co. executives from around the world when invited to dine and network during a fall executive training event at Lambeau Field. Accounting students attended the Institute of Management Accountants Conference in St. Louis, MO, with support from local firm, Wipfli. Biology faculty and students teamed-up with the Medical College of Wisconsin-Green Bay to sponsor the inaugural “Tiny Earth” event at Lambeau Field aimed at using undergraduate research to discover new antibiotics. The Environmental Management Business Institute (EMBI) and Aurora BayCare partnership provides real world energy and waste-reduction training for students. Students are both engaged in improving the environmental and energy footprint for the hospital, and are given leadership experience as an active member of Aurora’s Facilities Energy Team.